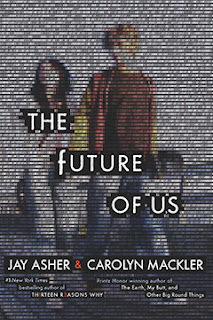 The Future of Us came out a couple of weeks, and if you don't already have it, put it on your Christmas wishlists right now! It is AMAZING. I didn't so much read it as I devoured it last month. The concept, the dialogue, the characters, the relationship dramas are all jsut so real and engaging! I knew that there wasn't any other book I could possible choose as the prize for December's Monthly Commenter Contest! How to win: Every time you post a significant comment that contributes to the conversation, I give you an entry into the contest! The more you comment, the more you entries you get! Only comments on posts from December 2011 are eligible, so keep coming back for more posts and more chances to comment. For all of the details, click here. To read my review of the book, click here! I loved this book so much, and I sincerely hope that you do as well! Enter away! Wow! this one sounds seriously, seriously awesome!! This has been on my wishlist for quite some time! I can't wait to read it. For English, I based a TV show idea on this! I turned out great and now I REALLY want to read this book! This book has been on my wish list ever since I read an Entertainment Weekly article with Jay Asher (loved his book) in which he said he was writing a book with Carolyn Mackler (she's awesome too). I really need a few quiet weeks so that I can get through all of the books I want to read. This book sounds really interesting. I would love to read it! I can't wait to read this! I'm currently reading "13 Reasons Why" and I wonder what his collaboration with Carolyn Mackler will be like. I love the way he explores how people interact with technology in his books. Just realized I'm having trouble imagining what life without broadband internet would be like... THANK GOD. RIP Dial-up.